Slough Jets held home ice advantage in the local derby against Bracknell Bees with Andre Vasiljevic making his debut in net. After some tense opening exchanges Shaun Thompson broke the deadlock at 14.45 with the game’s opening goal giving the visitors the lead. Alan Lack and Lewis Turner came together at 16.04 with the Slough forward defending a cross checking on his colleague JJ Pitchley. On his return from injury Matt Foord scoreD the second at 17.21 and the first period ended 0-2. Slough fought back in the second period and Ales Padelek made it 1-2 at 24.20 and just 28 seconds later Kamil Tvrdek scored on his former team to level the game. With no further scoring in the middle period the teams took the second interval at 2-2. 4.16 into the third period Ollie Bronniman scored the game winning goal and at 48.30 Thompson netted his second, this one a powerplay goal for 2-4. Slough called their time-out with 2.25 left to play and pulled the goalie but Scott Spearing finished the easiest of chances into the empty for a flattering 2-5 scoreline for the visitors. 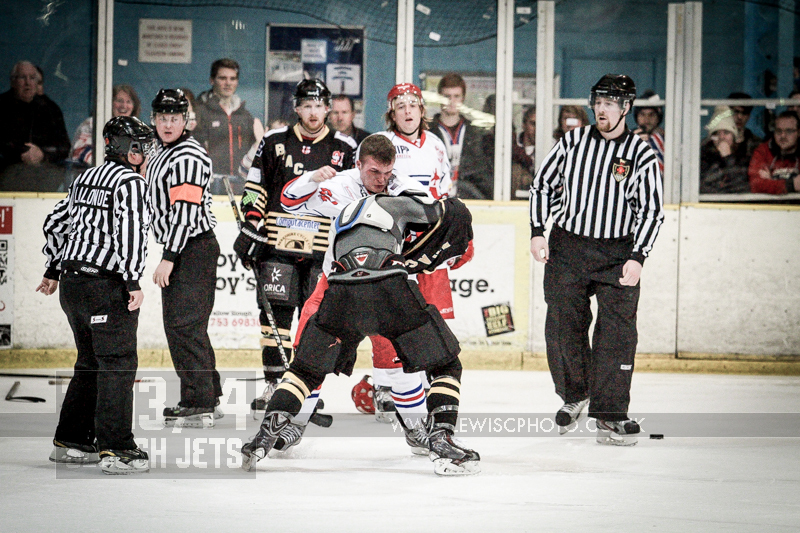 With the cup semi-final dates announced Slough Jets journeyed to Basingstoke to face the Bison in a league match. Slough’s Captain, Michael Wales, opened the scoring finishing from Aaron Connolly and James Hutchinson at 4.33 and despite the teams trading powerplays there was no further scoring ahead of the first interval. 3.42 into the second period Tony Redmond made it 1-1 when he netted and at 33.57 Doug Sheppard netted on his former team with the game winning goal completing a 2-0 middle period. It took 1.38 of the final period before Greg Owen netted Basingstoke’s third goal and Sheppard netted his second at 45.33 to make it 4-1. Slough called their time-out after the fourth goal but neither team managed to score after the time-out and the 4-1 score line became final. Slough Jets welcomed the Swindon Wildcats to the Hangar and took on their opponents with just 13 EPL players and 2 ENL players. The second period ended tied at 2-2 but soon after Slough had made it 5-0 Swindon changed netminder. Dan Davies scored at 22.19 to make it 4-0 and Paddy Ward scored a powerplay goal at 26.12 before Chris Douglas came on to replace James Hadfield at 28.14. Matt Foord scored at 29.29 to get the visitors on the board and Joe Baird converted a powerplay at 36.25 to make it 5-2. Swindon dominated the shooting in the third period as the shorter home bench began to tire but Koulikov buried his second at 44.12 to extend the lead to 6-2 and with neither team adding any further goals 6-2 ended up the final score. 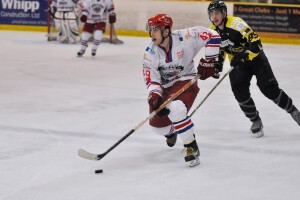 Planet Ice Milton Keynes played host to the Lightning as they entertained Slough Jets. Slough were in the lead after 4.21 when Ryan Watt scored his first goal for his new team but at the other end of the period Nick Poole converted a powerplay to make it 1-1 with 2.53 remaining. The middle period passed by scoreless despite the visitors bombarding Barry Hollyhead with 23 shots and Gregg Rockman facing 9. Both teams killed penalties and it was left to the final 20 minutes to decide the game. Milton Keynes netted their second powerplay goal of the night at 43.08 from Leigh Jamieson to take the lead but at 44.53 Blaz Emersic levelled at 2-2 back at even strength. Joe Greener netted the game winning goal at 46.18 and Slava Koulikov scored into the empty net in the final second of the game to make it a 2-4 win for the visitors.